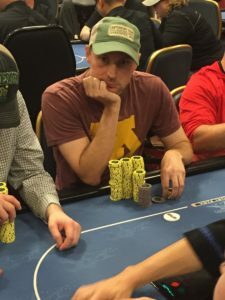 Eric Frankson open shoved all in from the button 3 handed, to which Scott Koernig made the call from the SB, as did Brett Hueckman from the BB. 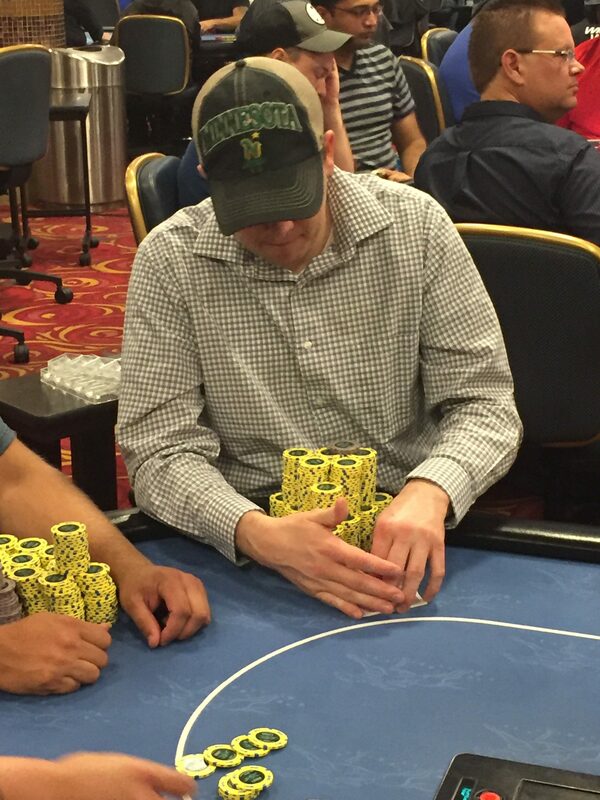 Koernig, as the biggest stack of the 3, moved all in. Hueckman called after about 5 seconds of deliberation. The board ran out clean to secure Scott Koernig the double knock out and give him the victory! 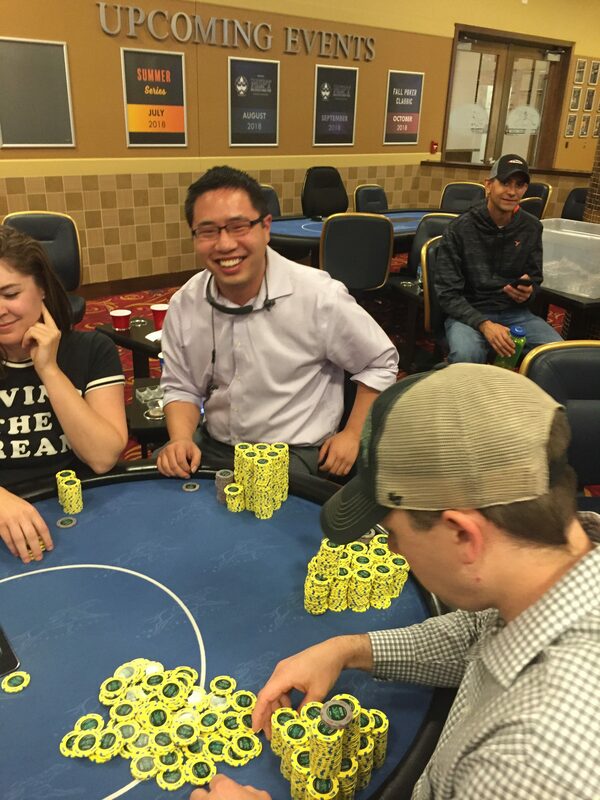 Congrats to Eric Frankson for his third place finish tonight that guaranteed him $1,017! 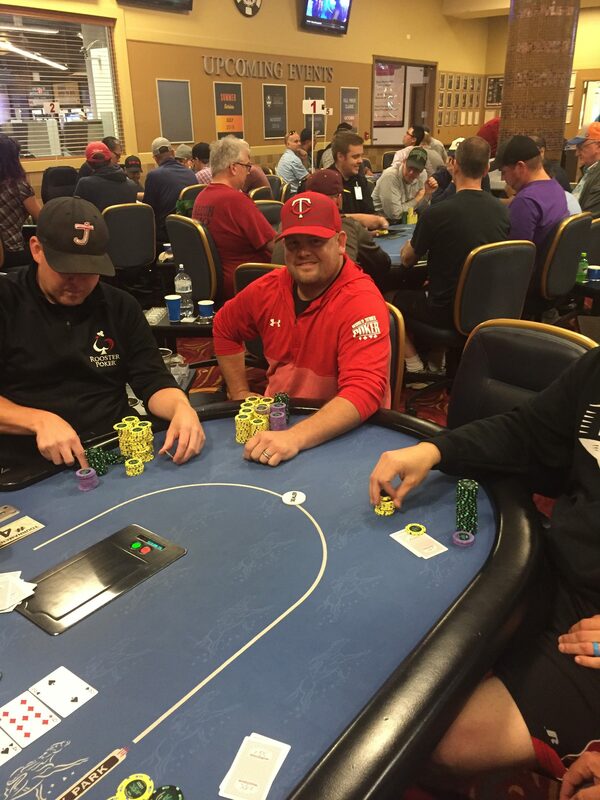 Congrats to Brett Hueckman for his second place finish worth $1,305! 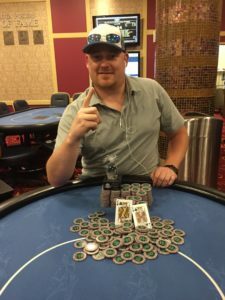 And finally, a hearty congrats to Scott Koernig for taking down Event #1 this weekend, which was worth $2,053! Thank you to everyone who played today and help us raise another $645 for Ronald McDonald House – Upper Midwest! 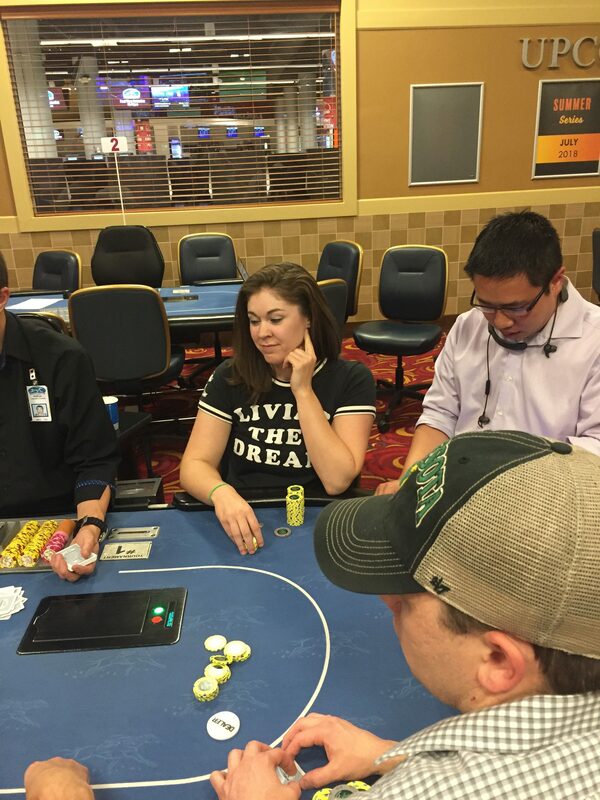 We’ll be back at it in 7.5 hours for Event #2: $250 NLHE “Winners Shown.” Don’t miss it! To see the full results from tonight’s tournament, click here! Congrats to Kevin Kelly for his 4th place finish tonight, he played real tough from what we saw. 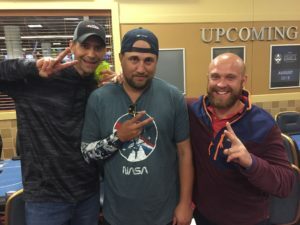 Ricky Bobby ended up all in preflop against Brett Hueckman in what essentially amounted to a preflop race with KJx against Hueckman’s 99x. The board did not improve Ricky Bobby’s hand, so he exits in 5th place. Good work tonight! 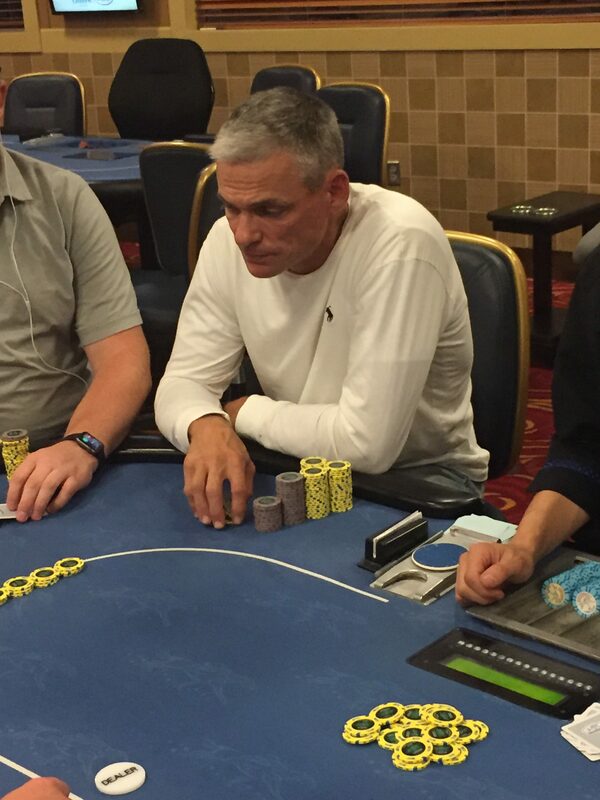 After an open raise to 60k, Brian Edgington moved all in from his small blind for a total of 140k. The flop came A♥ K♦ 3♣, and after the discards, he got to learn his K♥ J♠ was behind his opponent’s K♠ Q♥. A turn of an A♦ and a river of a 6♣ resulted in Edgington’s night ending. Congrats and well played tonight! In the mean time, it’s been entertaining watching 6 players duke it out, trading jabs, waiting for someone else to make a mistake. Super Strong run tonight Travis, thank you for playing! We have our 8th place finisher tonight, Cory Gogerty! Well played tonight, sir! Congrats to Bridgette Field, our 9th place finisher tonight! 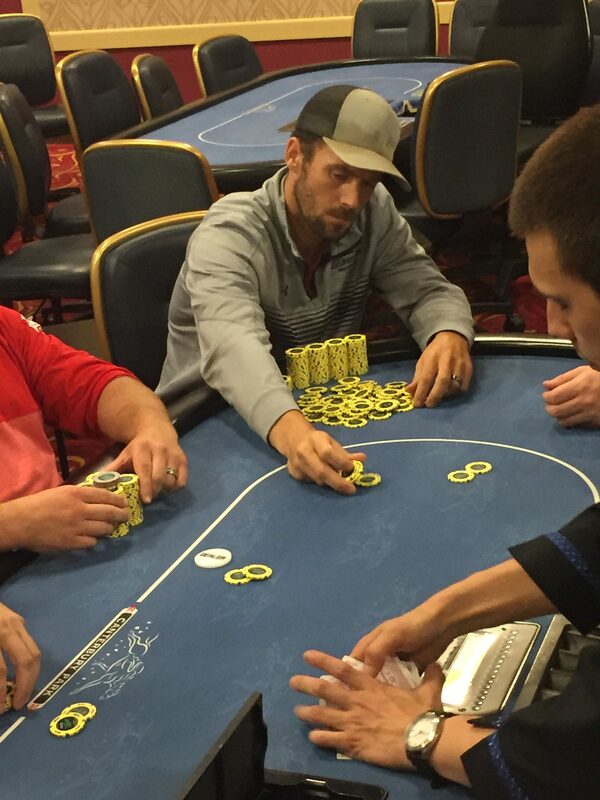 Well done grinding out a small stack the last several hours of play! 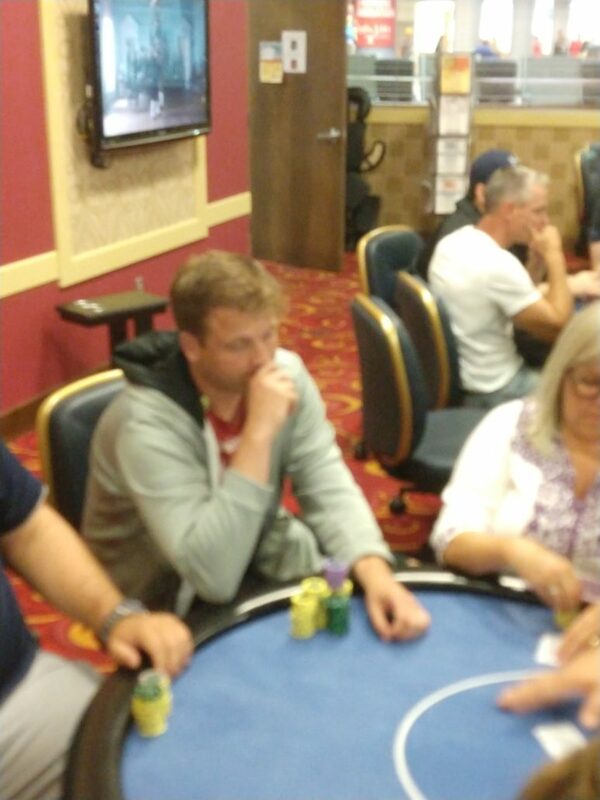 Congrats to the first player to exit our final table tonight, Drew Goodson, in 10th place and taking home $313 for his play. Well done!